Here are my supporters, without them all this couldn´t happen, so THANK YOU GUYS! I am stoked to ride for this young & uprising Company! The Team is dedicated to bike enthusiasts, love riding and improve themselves from year to year. I also love the fact that they are very close to the “Propain Friends”, very important for me to be close with people who ride a Propain or want to get one. For me it’s amazing to give my feedback about the Bikes to them and work on the Women Line for the future. I am really looking forward to create something great over the next years with them! Sram / Rockshox rock the business for years now, the Forks and parts which they provide me are just simply amazing. Really love their support over all the events, it never gets boring with them. Such a chillaxed Crew. Without them I would bike naked ? No matter if it’s Summer or Wintertime, Maloja got everything what you need. All the years I work with them together been always super exciting, we travelled together to Peru, USA, Slovenia… being part of the Catalogue is a big pleasure. Super stoked to have such passionate people with me. Where should I put all my stuff I travel with? In EVOC bags of course : ) Many of you already know the Bike bag and protected back bagsfrom them, but they got so much more stuff you can play with! Super lovely people who know what we need. Oakley is my partner since I started Downhill racing back in the days. They never disappointed me, the Sunglasses and Goggles protected my eyes several times. There is a lot more behind great quality sunglasses beyond looking good, and Oakley are the best when it comes to great Style and Quality. The only connection between your bike and the ground are the Tires, so it is really important to have a great Product on your wheels. I am really excited to get supported by Maxxis Tires, they got high-quality products for every condition that might occur when you ride Trails. Affordable for your budget, you won´t be disappointed by their perfomance and have fun riding them! THE place to be in summer & winter 🙂 I know the Spielberghaus family for years now and I always love to come back to this place. It’s a great starting point for biking & other outdoor activities, a nice venue to relax afterwards, excellent food… We also hold the Ladies Session at the Spielberghaus, it’s always a great experience for the Ladies. 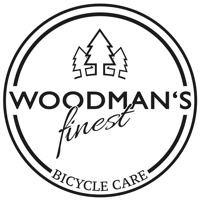 Christian the founder of Woodman´s finest worked as a world cup mechanic for over 12 years. With all his experience he created some high quality bike care Products which also smells really good too 🙂 I love them! The dudes from Ego Kit are super crazy, but in a good way 😉 The first time when I tried my YT Tues DH Bike with that Ego Kit I was just screaming and smiling all the time! So much FUN to ride with it! I am stoked to have the opportunity to ride with this gadget and step up my „Speed Game“. Thanks guys!